"Italian anise cookies with light frosting and sprinkles!" Preheat oven to 450 degrees F (230 degrees C). Grease cookie sheets. In a large bowl, stir together the flour, 1 1/2 cups confectioners' sugar and baking powder. Cut in butter using a pastry blender or rub between fingers until well blended. Stir in the eggs, vanilla and anise extracts and mix into a firm dough. Turn dough out onto a floured surface and knead for about 5 minutes. Roll tablespoonfuls of dough into balls and place them 1 inch apart onto the prepared cookie sheets. Bake for 8 to 10 minutes in the preheated oven, or until firm. Remove from cookie sheets to cool on wire racks. In a small bowl, stir together 1 cup confectioners' sugar and 1 1/2 tablespoons water. Drizzle over cooled cookies and decorate with sprinkles. Something is wrong with this recipe. There was no way to form dough. Please check. I should have looked at the first review. The cookies were terrible! Excellent recipe. I'm so happy I tried it. Could also be used with any flavoring besides anise extract. Dough and cookies came out perfectly!!!! 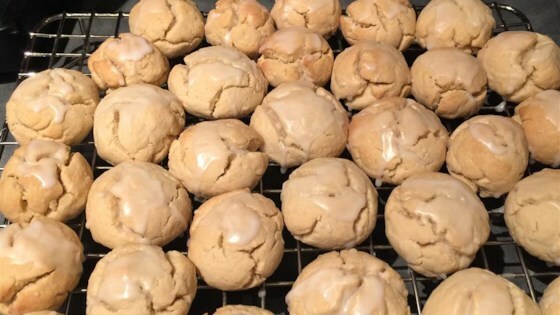 Great recipe Italian anise cookies !